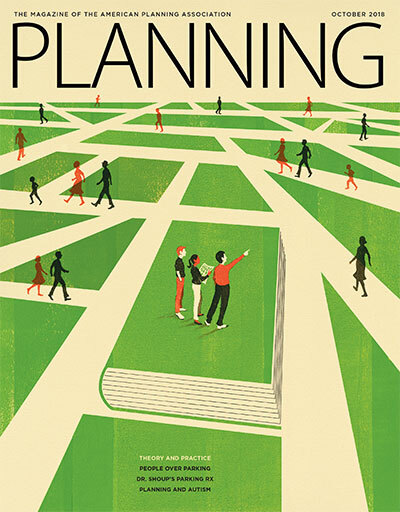 Many university planning programs welcome practitioners as adjunct faculty to help students develop "real-world" planning skills they will need early in their careers. Planning's October cover story examines the challenges and rewards — for both teachers and students — of combining practice and theory into a successful curriculum. Planning schools are enlisting practitioners to teach students lessons from the field. Story by Linda McIntyre. A new digital project is bringing life to the legacy of advocacy planning’s pioneer. By Kenneth M. Reardon. The doctor is in — Donald Shoup outlines the treatment plan for your parking maladies. Maxwell Hartt catches up with Deborah and Frank Popper, 30 years after their controversial Planning article on the Buffalo Commons. Plus, read the original article. Cities are starting to prioritize affordable housing for residents over parking spaces. Jeffrey Spivak reports. Kyle Ezell, Rick Stein, and Gala Korniyenko provide lessons for planning with — not for — people with autism. Great Places, Planning Home, APA Learn. The future of shopping and more on fair housing. 2018 state ballot preview, municipal bond costs, Native American statues. Planned unit developments that work. A bimonthly department aimed at planning commissioners. Edited by Kimberley Jacques. A constitutional right to a green city. Out-of-the-way towns, healing spaces, the cycling city. Braddock, PA, gender-inclusive style guide, Planners Playlist. Planning can't be a desk-bound profession.